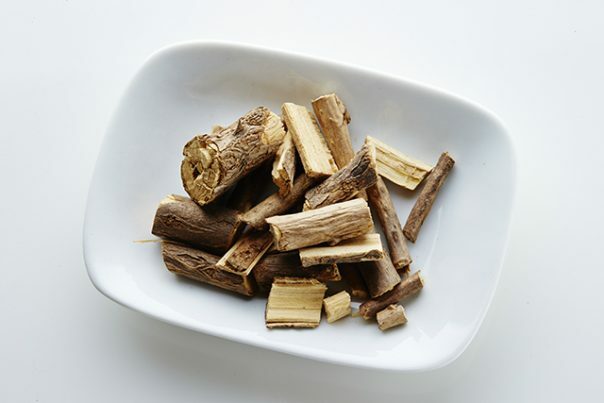 Eleuthero, which has the scientific name Eleutherococcus senticosus of the ginseng family Araliaceae, is endemic to China, and is also called ci wu jia, Siberian ginseng, and Ussurian thorny pepperbrush. It has been an adaptogen – or a substance that stabilizes physiological processes and promotes decreased cellular sensitivity to stress – in ancient China for thousands of years now. Around 30 species can be classified under the genus Eleutherococcus. Some of them are cultivated in the West for ornamental purposes. The genus’ members include the famous American ginseng (Panax quinquefolius), Korean or Asian ginseng (Panax ginseng), and the Devil’s walkingstick (Aralia spinosa). Eleuthero has been used in traditional Chinese medicine for millennia already, as stated in Shen Nong Ben Cao Jing or The Divine Husbandsman’s Classic of the Materia Medica; however people in the world have hardly taken it any notice until the Russians took to studying it for its medicinal effects in the 1960s. Eleuthero smells pungent and has a slightly bitter taste. Aside from being adaptogenic, eleuthero has hypocholesterolemic, choleretic, hypoglycemic, tonic, diuretic, and stimulant properties. Eleuthero is used to treat people who experience sleeplessness. Eleuthero is now widely cultivated and used to promote strength and stamina. Eleuthero can interfere with the function of adrenal glands by helping to avoid adrenal hypertrophy and reducing the corticosteroid production levels, which increase stress levels. It eases prolonged exhaustion due to overwork and long-term stress and addresses issues of massive muscoskeletal pain like fibromyalgia. In a 2009 research review that was published in 2009 in Current Clinical Pharmacology, eleuthero was found to help boost mental capabilities in people with high fatigue levels. Eleuthero contributes to an overall sense of general well-being. It helps fight off infections, diseases, and environmental toxins and minimizes the effects of radiation and chemotherapy. Eleuthero has anti-inflammatory properties. In a 2009 study that was published in The Korean Journal of Physiology and Pharmacology, osteoarthritis patients who were given a treatment of eleuthero, Chinese foxglove, and Panax ginseng for six weeks reported great improvement after the study. Eleuthero can help regulate cholesterol levels, a study that was published in Biochemical and Biophysical Research Communications in 2008 showed, thereby reducing instances of diabetes. Eleuthero is good for the immune system. It can be used to treat colds and flu, especially when ingested in combination with the herb green chiretta (Andrographis paniculata), according to the National Institutes of Health and a 2004 study that was published in Phytotherapy Research that observed 130 children. For best results, the double treatment of eleuthero and green chiretta should be administered for four to five days. Eleuthero is good for the male reproductive system. It can be used to treat impotence. Eleuthero is good for the circulatory system. Eleuthero is good for the cardiovascular system. It can help stave off heart ailments such as atherosclerosis. Eleuthero is good for the nervous system. It can help prevent the onset of Alzheimer’s disease. Eleuthero is good for the respiratory system. It can help address ailments such as bronchitis. Eleuthero is good for the excretory system. It addresses diseases of the kidney. Eleuthero can be used as a dietary supplement. Sometimes, it is also used as an ingredient in skincare products. Using eleuthero for a short period of time produces no significant harmful effects; however, long-term use can trigger side effects such as headaches, nervousness, and drowsiness. You should also avoid using eleuthero if you are prone to having elevated levels of blood pressure, you have a heart ailment or diabetes, you have a hormone-sensitive condition such as breast cancer or uterine fibroids, or you have a mental illness such as schizophrenia. Clean Yp Your Mind, Body And Life For Spring! Eleuthero is good for the immune, male reproductive, circulatory, cardiovascular, nervous, respiratory, and excretory systems. Eleuthero contributes to an overall sense of general well-being.